Students protested police brutality in commemoration of the death of Alexis Grigoropoulos, a 15-year-old student who was shot dead by a police officer in 2008. 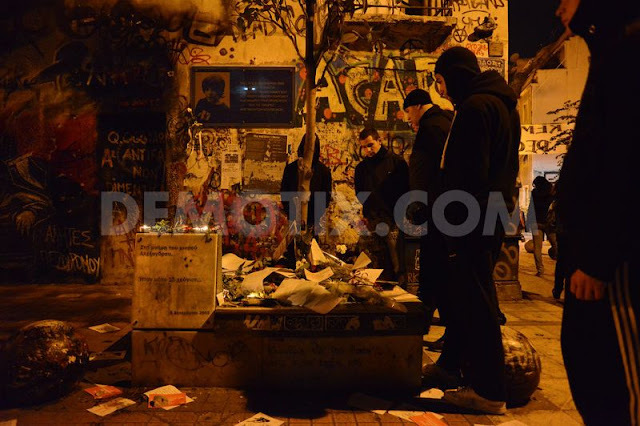 Two demonstrations were held and a temporary memorial set up at the spot where he died. Riot policemen in Exarcheia district, pictured resting during clashes with demonstrators. 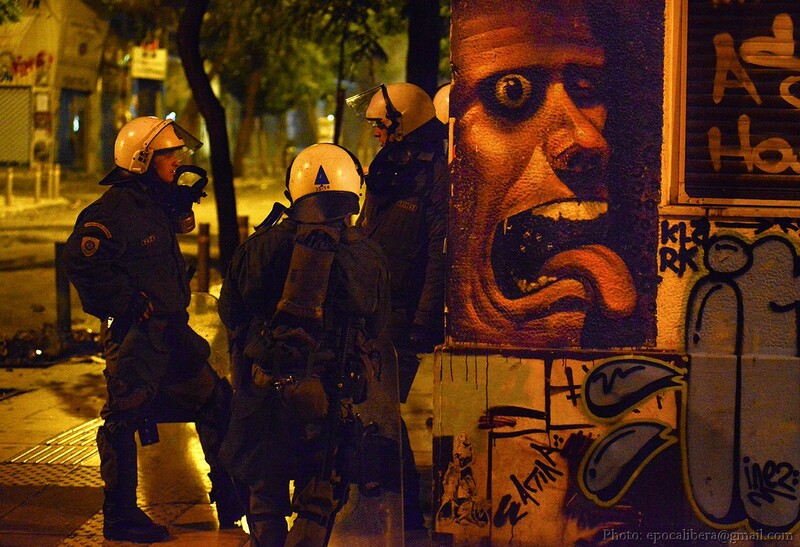 On a wall behind the officers can be seen graffiti artwork. 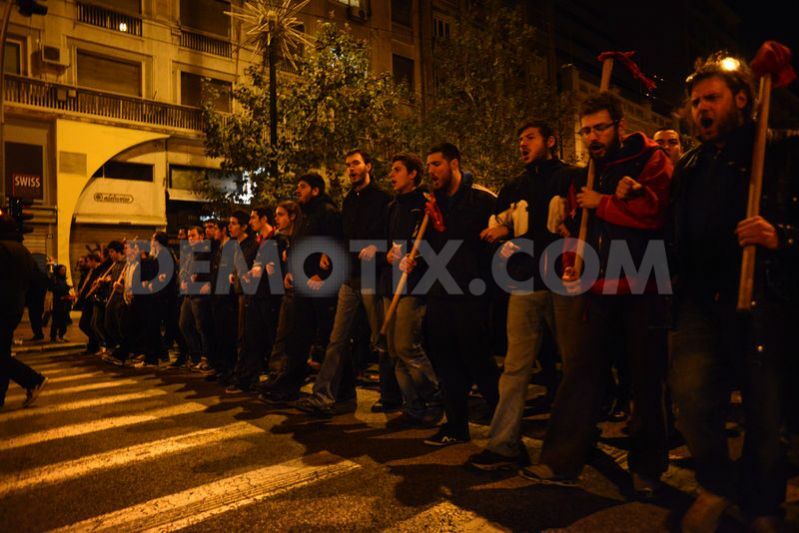 Young men during the memorial gathering on the site of murder. A companionship of young people, reads the notes left for Alexis, during the memorial gathering on the site of murder. 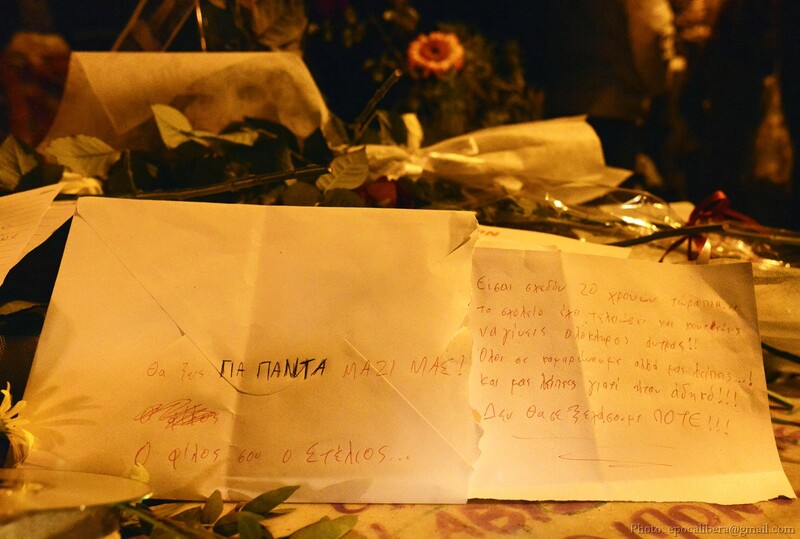 A letter written by a classmate of Alexis, named Stelios, is left during the memorial gathering on the site of murder. Full text of the letter on the story. το σχολείο έχει τελειώσει και κοντεύεις να γίνεις ολόκληρος άντρας! 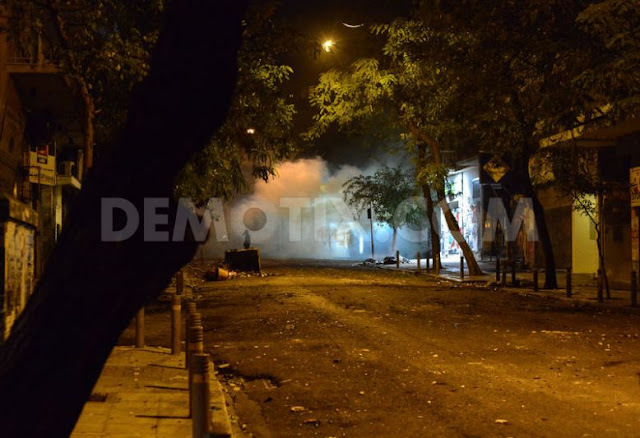 Όλοι σε καμαρώνουμε αλλά μας λείπεις...! Και μας λείπεις γιατί ήταν άδικο!!! 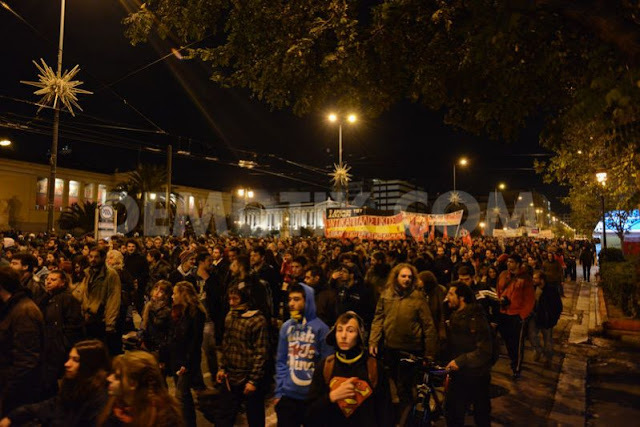 Δεν θα σε ξεχάσουμε ΠΟΤΕ!!! 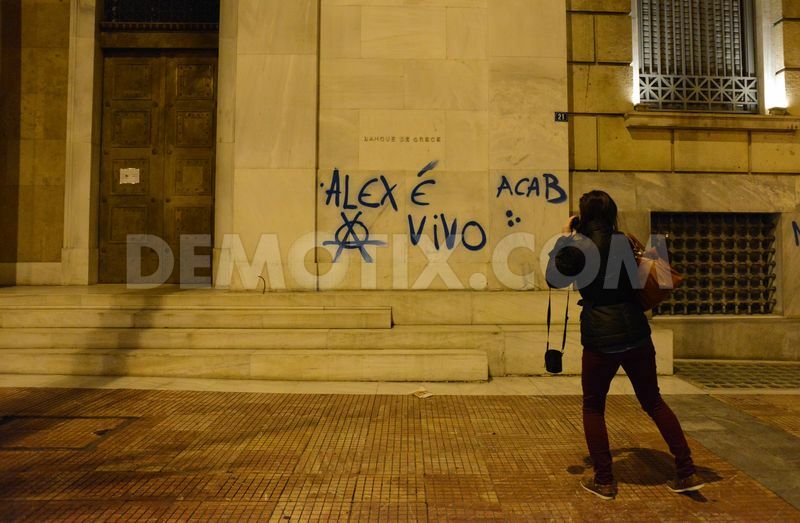 A young woman passes by the "Bank of Greece" after the demonstrations and makes a picture of the slogan sprayed on the wall of the Bank, that reads: "Alex e vivo" and the anarchists sign. 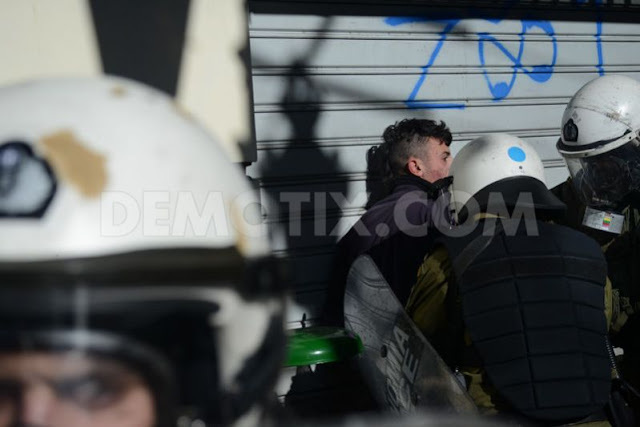 A man wearing gas mask can be seen during clashes with Police in Exarcheia Square. Students during a protests, shout slogans and hold a banner that reads: "This day will always be yours, because cops shot your generation", referring to Alexis Grigoropoulos, a 15 year-old who died in 2008 after being shot by a policeman. 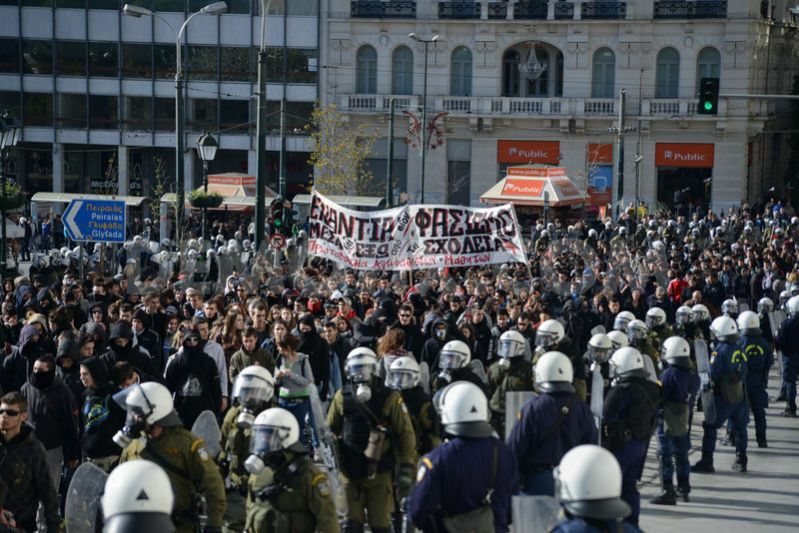 Students protest surrounded by heavy Riot Police forces in Syntagma square, with the main banner of the demonstration, that reads an antifascist slogan. Students protest shouting slogans surrounded by heavy Riot Police forces in front of the Greek Parliament. 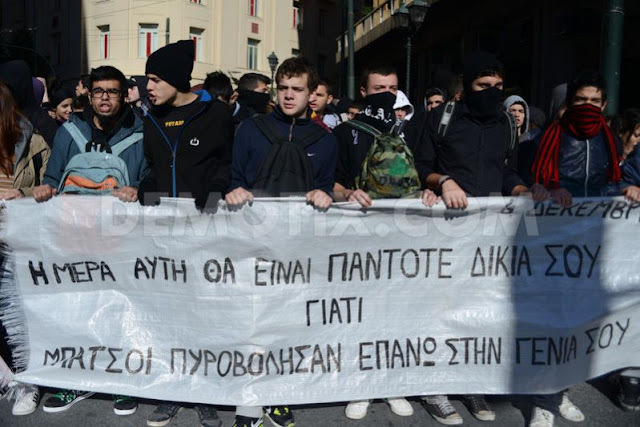 They hold a banner that reads: "You give money to the banks and bullets to youth". Students protest and shout slogans in Syntagma Square. 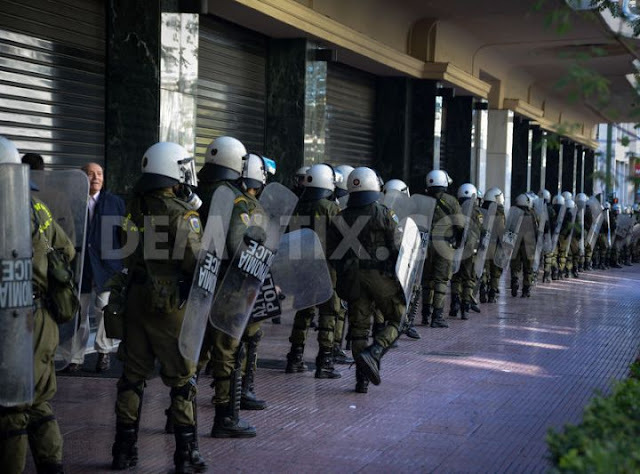 An elderly man can be seen watching the scene as riot police march past him outside a shopping center as protest takes place to remember Alexis Grigoropoulos, a 15 year-old who died in 2008 after being shot by a policeman. 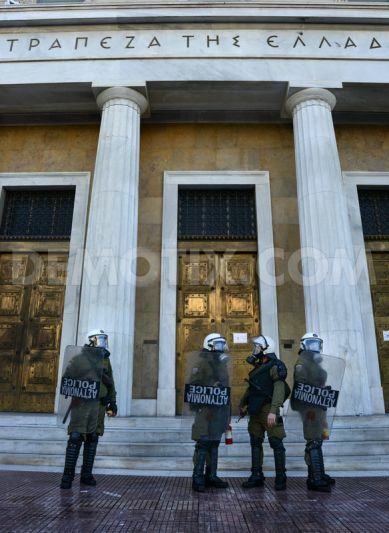 Riot Policemen stand at the entrance of the "Bank of Greece" building. Riot police detain a young protester in Omonoia Square. 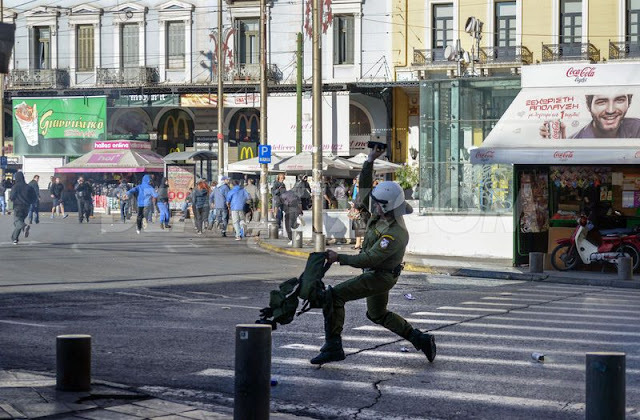 A riot policeman throws a stun grenade towards protesters in Omonoia square during a demonstration over police violence and to remember Alexis Grigoropoulos, a 15 year-old who died in 2008 after being shot by a policeman. 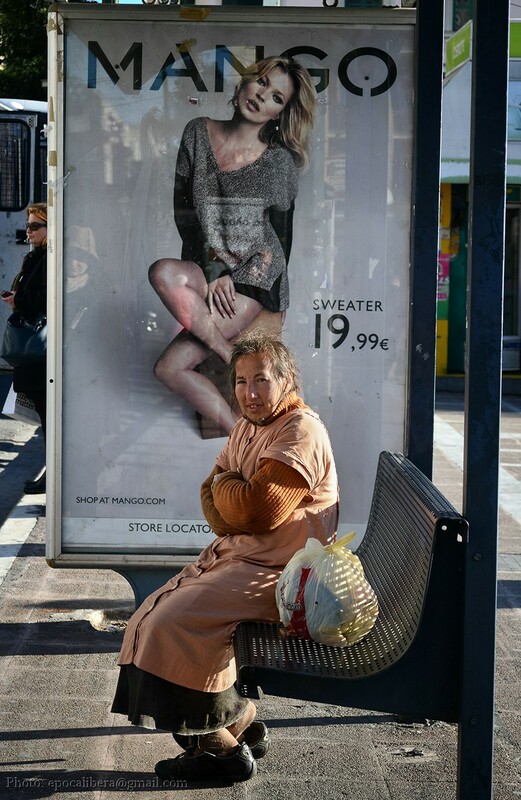 A homeless woman can be seen during the protests, while standing on the seat of a bus stop, in front of an advertisement with Kate Moss. 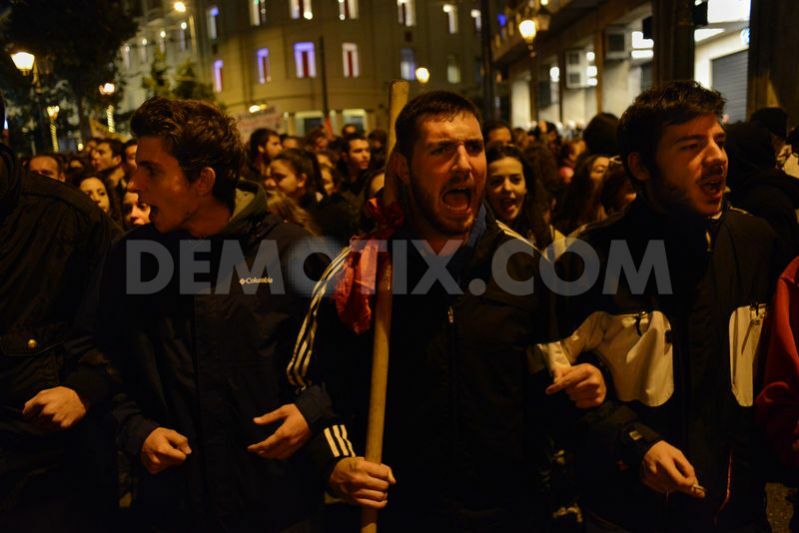 Students protest shouting slogans during the evening demonstration near Syntagma Square. 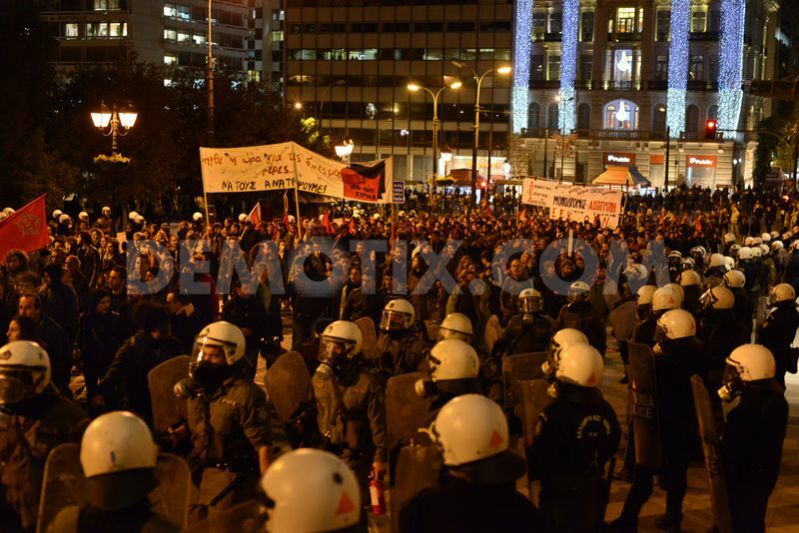 Young people protest surrounded by heavy Riot Police forces in Syntagma square, during the evening demonstration. Young people protest in Panepistimiou Ave. during the evening demonstration. 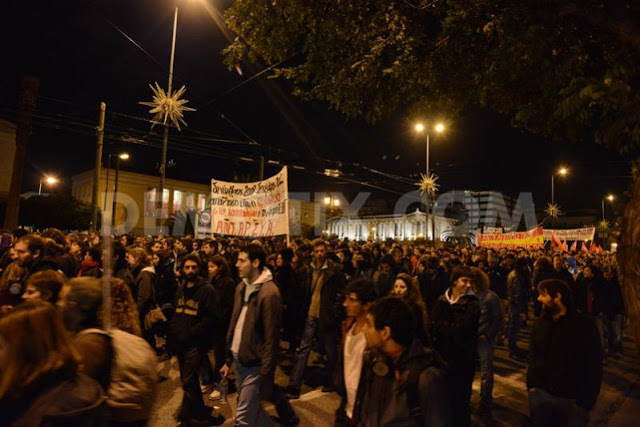 Young people protest in front of the Athens Academy during the evening demonstration. Young men protest and march shouting slogans in Panepistimou Ave. During the evening demonstration. 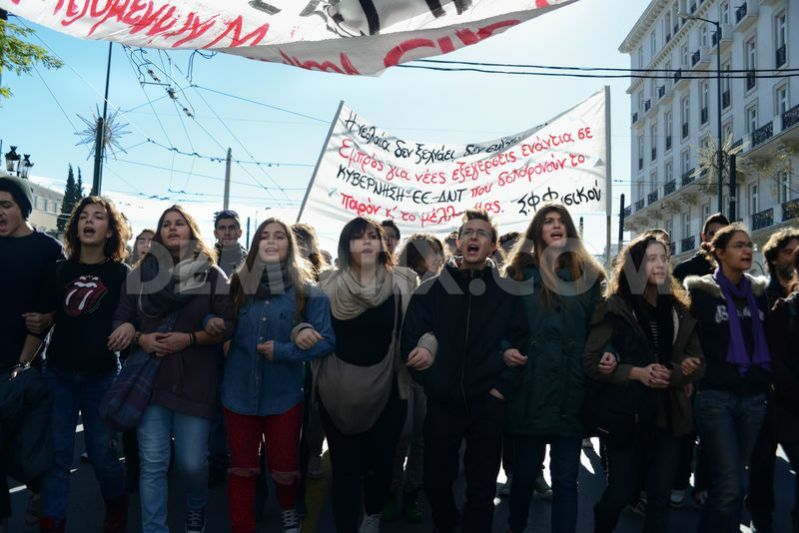 Students protest Police brutality in commemoration of the assassination of Alexis Grigoropoulos, a 15-years-old student who was shot dead by a Police officer on December 6th, 2008. Two demonstrations are held and a memorial on the site of murder. 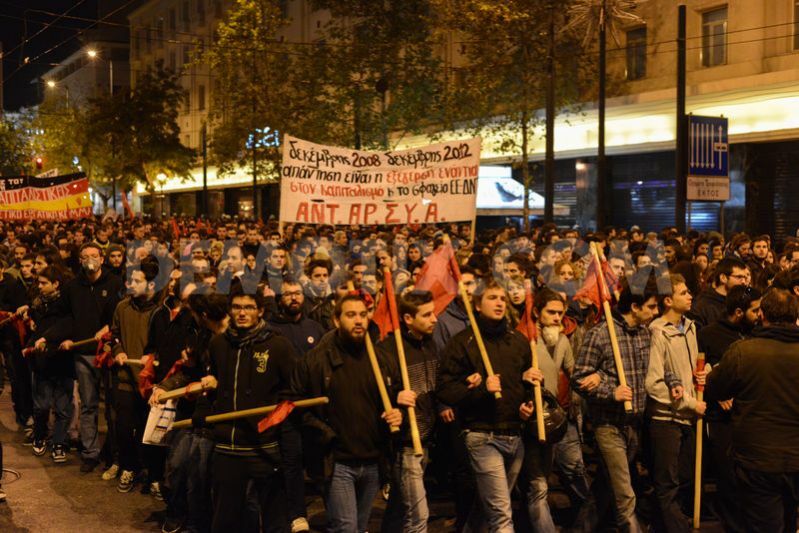 Athens, Greece, December 6th, 2012. 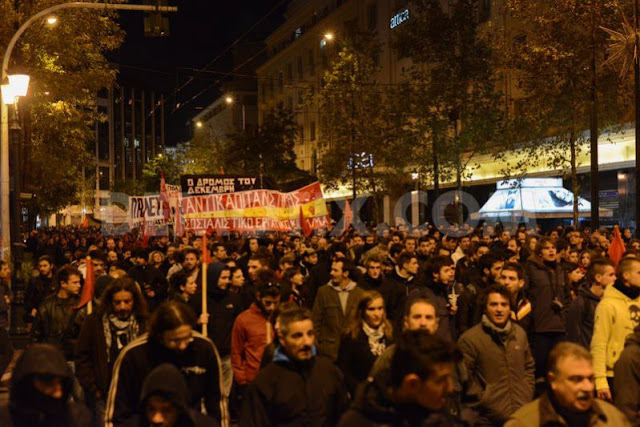 On the fourth anniversary of Alexis murder, thousands of students and young people demonstrate in Athens center. 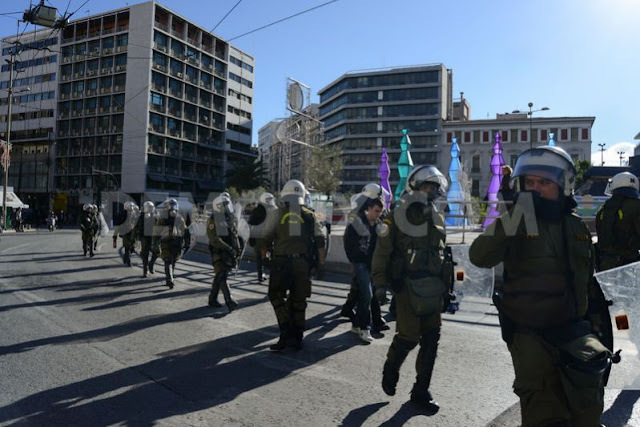 Police deploys some 5,000 policemen to prevent possible riots. Two metro stations (Syntagma, Panepistimio) have been closed to public as of 10 a.m., until the end of the day. Both demonstrations are mainly peaceful, and protesters shout slogans against Police brutality, and against fascism. 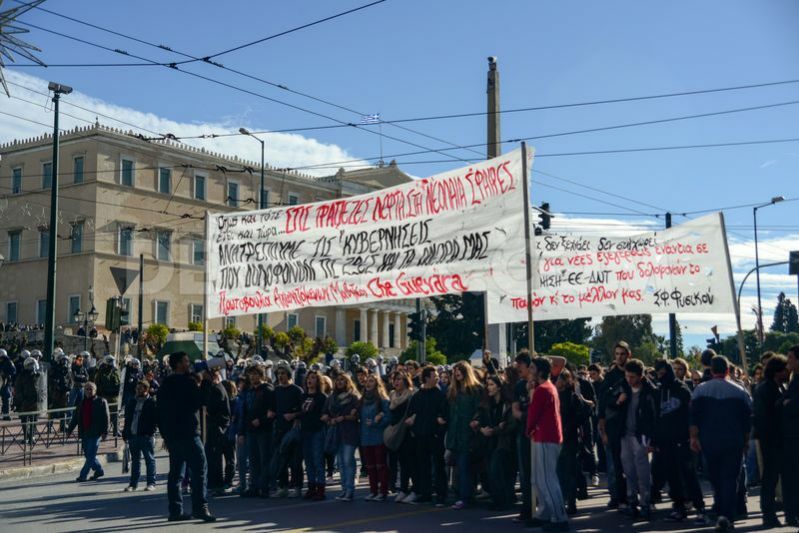 "You give money to the banks and bullets to youth" a banner reads. Both demonstrations ended in clashes with Police and at least 78 people have been detained of which 9 were arrested. 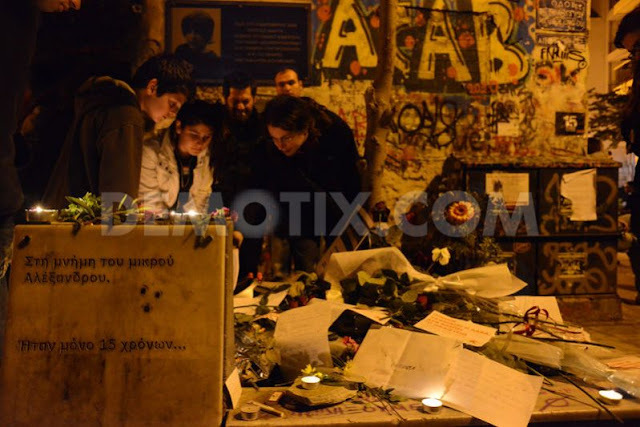 At 9:00 p.m. a memorial gathering is held on the site of murder, where a monument is built with Alexis picture and flowers. Many people leave there some notes written on paper. You have finished college, and you are now an adult. We are all proud of you, but we miss you...! And we miss you mostly, because it was unfair!!! 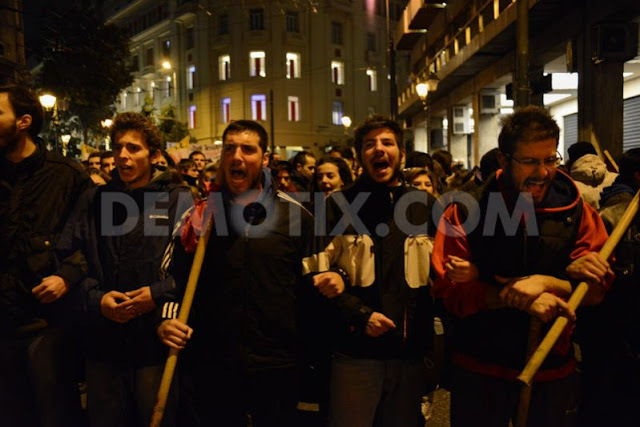 You're gonna live with us, for EVER!! !